A delegation of more than a dozen teaching staff from University of Macau’s Department of Communication, led by their Department Head Prof. LAM Iok Fong, paid a visit to HSMC in July 2011. The main purpose of their visit was to call on the TV studio of our BJC programme, and prepare for the construction of their TV studio on the new campus of University of Macau. Principal Dr. H.S. Chui and Provost Prof. Gilbert Fong delivered a welcoming speech and briefly introduced the future development of our college to the delegation before their tour to our TV studio. Principal Dr. H.S. 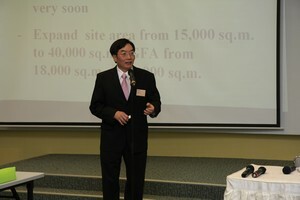 Chui briefly introduced the future development of HSMC. Provost Prof. Gilbert Fong delivered a welcoming speech. 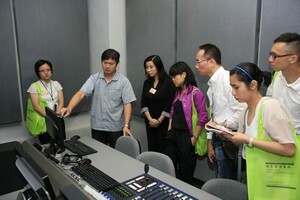 Dean of School of Communication, Prof. Scarlet Tso gave an introduction of the setup and equipment of BJC’s TV Studio. Prof. LAM Iok Fong, Head of Department of Communication, University of Macau, introduced her teaching staff. 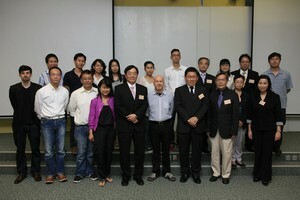 Group photo of teaching staffs of University of Macau and HSMC. Prof. Wu Ho Fung Kwan and Technical Officer Mr. Ng Yiu Chung shared their experience of setting up a TV studio. 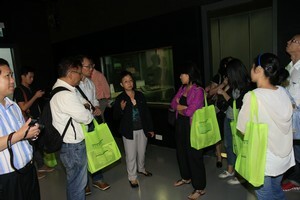 Prof. Wu Ho Fung Kwan gave a guided tour for the University of Macau delegation. Mr. Ng Yiu Chung demonstrated the operation of the system incorporated in our studio.